Elisa does come off as the type who would sleep with her gun beside her. Although we know she doesn’t shower with it. So does the colorist have to do the inking too? And who letters? It’s just strange to see no inker or colorist credited in a modern comic. It’s an odd thing to harp on but I’m becoming more creative-minded lately. What they got right: Vinnie gets a good send off and hopefully things get better for the poor guy. The action is good. I also like how Fox and Lexington get along but only for the sake of Alex, and seeing Xanatos decide to play with his son rather than answer the call from the Illuminati. That’s kind of what I was talking about last week about the potential. It’s why I wish the episode where Fox and Lex finally connect wasn’t one of the stories dropped. Weaker as Goliath Chronicles was I see potential to build on. I’ll try not to harp on it so much because I’ve already got my thoughts out, but this was the last story that actually comes from the show. From here on it’s Weisman’s original ideas. What they got wrong: I know the scene with Brooklyn watching Broadway and Angela being romantic with each other is supposed to represent his wanting a mate and not necessarily wanting Angela specifically but it’s not how it comes off. This leads to a problem I’ll get into in a later issue I had, based solely on personal events, although I’ve heard they fixed that after I stopped reading. Otherwise I don’t have any real problems with the issue. Recommendation: These two issues at least are must-reads for fans because they’re adapting the only episode of The Goliath Chronicles that Weisman worked on (occasional dialog in one episode aside) and are considered canon. It’s also a good story to check out and you only need to know about the backstory if you want to know more about the series afterwards. 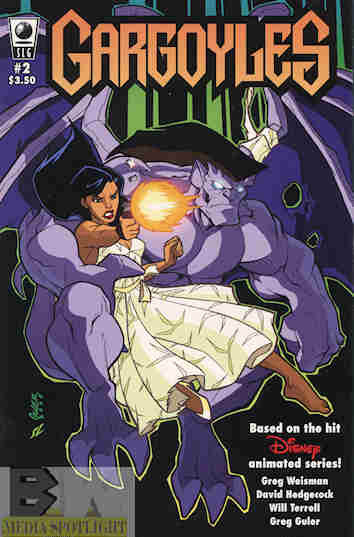 Posted by ShadowWing Tronix on April 4, 2018 in Animation Spotlight, Television Spotlight, Yesterday's Comics and tagged Elisa Maza, Gargoyles, Goliath (Gargoyles), Greg Weisman, Quarrymen, SLG Publishing.